Food allergy is a common problem that affects approximately 4 percent of adults. While allergies to foods such as milk, soy, wheat, egg, nuts, fish and shellfish are most common, allergy to any type of food can occur. Allergy to red grapes can cause reactions to grapes and grape products, including raisins, wine and juices. 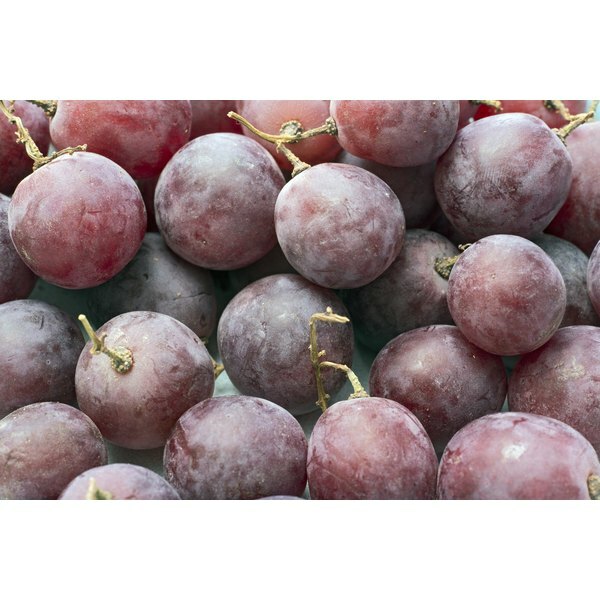 An allergy to red grapes occurs when a person's immune system mistakenly identifies the food as a foreign and potentially harmful substance. The immune system forms antibodies known as immunoglobulin E, or IgE, to the red grape. The next time the person eats red grapes or grape products, the IgE responds to the food and causes a release of chemicals that results in the symptoms of an allergic reaction. Symptoms of an allergic reaction to red grapes typically occur between a few minutes to an hour after ingestion. Symptoms might be limited to the skin and present as an itchy rash or hives, but a more systemic reaction that involves nausea, vomiting, shortness of breath, cough, voice changes and dizziness also can occur. A severe systemic reaction is called anaphylaxis and is life-threatening. A person with an allergy to red grapes might be allergic to the grapes themselves or to other substances on the grapes. Yeast, pesticides and mold can be found on grapes and are potential causes of an allergic reaction. Grape products often have sulfites added to them, which are another potential contaminant that can cause a reaction. A careful history, or discussion of the events leading up to the allergic reaction, is often helpful in determining the cause. If a reaction to grapes happens every time red grapes are ingested, the grapes themselves are the most likely cause. If the reaction occurs intermittently, it is more likely to be a contaminant on the grapes. Skin prick testing, a procedure that involves scratching the surface of the skin with the allergen and measuring the skin reaction, also can be helpful in diagnosis. Avoidance of red grapes and all products that might contain red grapes is the basic treatment for a red grape allergy. If an accidental exposure occurs, antihistamines are given for a localized or skin reaction. For a more systemic allergic reaction, injectable epinephrine is given to reverse the reaction. If a person has a systemic reaction that requires epinephrine, he should go to the emergency department for further evaluation and treatment as soon as possible.